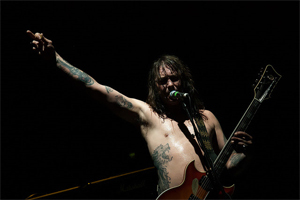 Herculean hard rockers HIGH ON FIRE have announced summer tour dates. The heavy metal pioneers will kick off the must-see live performances on August 12 in Cambridge, MA as headliners of the inaugural Converse Rubber Tracks Live Tour. The just-announced run will continue with stops in Toronto(Aug. 14), Brooklyn (Aug. 15), Los Angeles (Aug. 19) and San Francisco (Aug. 20). Tickets for the Converse Rubber Tracks Live Tour are free and the jaunt will coincide with Converse Rubber Tracks "pop-up" recording studios in each city, providing opportunities for emerging artists to unleash their creative spirit. Additionally, HIGH ON FIRE will appear among the featured acts at the 2014 Hopscotch Music Festival, set to take place September 4-6 in Raleigh, NC. HIGH ON FIRE, who feature guitarist/vocalist Matt Pike, drummer Des Kensel and bassist Jeff Matz, will headline the Lincoln Theater on Saturday, Sept. 6 as part of the festival, with WITCH MOUNTAIN, SUBROSA and DEMON EYE opening the evening's festivities. HIGH ON FIRE will showcase at Hopscotch alongside fellow headliners MASTODON, ST. VINCENT, SUN KIL MOON, THE WAR ON DRUGS and more. For full details, visit HopscotchMusicFest.com. Finally, HIGH ON FIRE will take its audio annihilation to the sea as part of the inceptive Motörhead’s Motörboat. Described as "the ultimate music festival cruise vacation", the seafaring soiree will set sail September 22-26 from Miami, FL aboard a Carnival Cruise ship, christened as "The Loudest Boat In The Wörld". Joining HIGH ON FIRE will be MOTORHEAD (natch), MEGADETH, ANTHRAX, ZAKK WYLDE, DOWN, TESTAMENT and more. Visit MotorheadCruise.com for full details. 9.21 - Orlando, FL - Will's Pub ? HIGH ON FIRE have begun work on their new, as-yet-untitled studio album. The group has convened for strategic writing sessions in both New Orleans, LA and Oakland, CA, with early reports indicating the band's new material to be both "epic" and "sonically huge". A 2015 tentative release date via eOne Music is expected for the new LP, the follow-up to 2012's De Vermis Mysteriis. "Everyone is asking what the new HIGH ON FIRE music sounds like," says Des Kensel. "Chew on some mescaline and listen to side B of SABBATH's Master Of Reality backwards at 78 RPM and it might give you an idea."